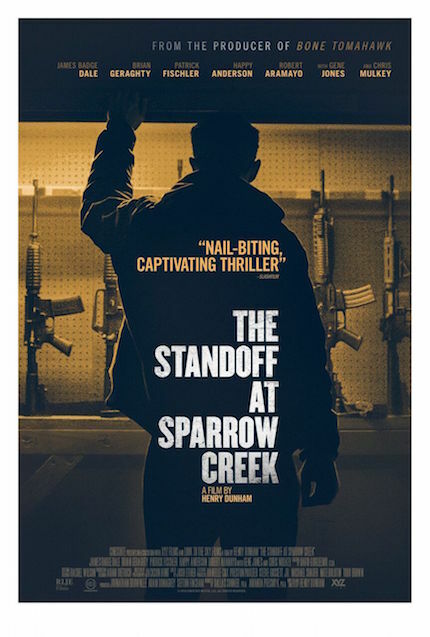 Writer/director Henry Dunham’s The Standoff at Sparrow Creek is a terrific mystery film with a twist, about a militia group -- with such actors as James Badge Dale, Patrick Fischler and Chris Mulkey as the diverse members -- that tries to discover over the course of one night, and in a single location, which one of its affiliates lost his mind, took a weapon from their warehouse and used it to kill several cops that were gathered at a funeral. The movie is finally arriving to theaters and Digital/On Demand this Friday, January 18, hence you can find my full 14-minute interview with Dunham in the video below. At last year’s Fantastic Fest, where his debut feature length film had its U.S. premiere, Dunham chimed in on the current landscape that makes The Standoff at Sparrow Creek a timely piece of work, possible comparisons with Quentin Tarantino’s Reservoir Dogs (“dudes in a warehouse”), the challenges of keeping interesting a single-location movie that relies a lot on conversations, and much more!